Log into the Staff Portal that has been launched through your database or remotely. See Launch the Staff Portal. Click Skills/Levels next to the class that you are working with to open the Skills/Levels Progress screen. Click the pencil icon, the skill/level name, or a skill/level status icon to make any updates. Add notes as needed with the page icon; these notes copy to the Student record on the Skills/Levels tab and can be viewed in the Parent Portal on the My Student tab. If the staff person is enabled to send emails in the Staff Portal and your Staff Portal Settings are set to Staff option to send email, click Yes orNo to email the student's skill progress to the parent. If you are set to Automatically send email an email is generated and automatically sent for each skill/level update with the exception of updates to the status Tested. When a student's skill/level is updated to Tested no progress emails are automatically sent. A history of these emails will be kept in the Family record > Misc tab > View Sent Emails. 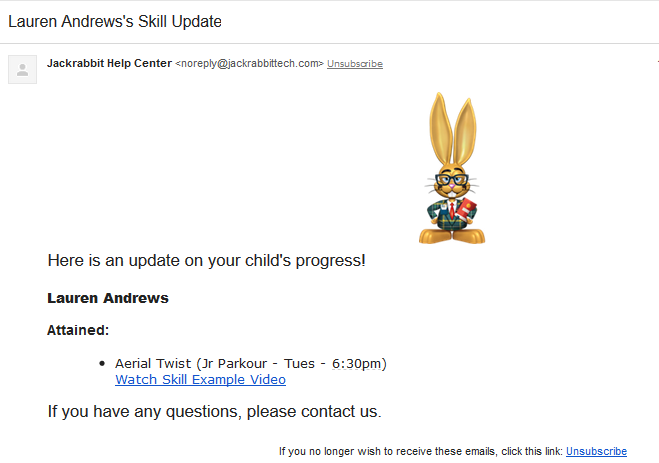 When a parent replies to a skills/levels progress email it is sent to your organization email address as designated on the Edit Settings page from the Tools menu. 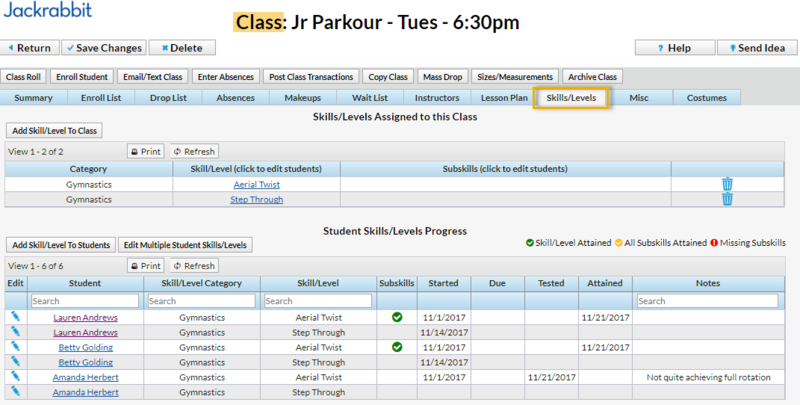 Skill/Level progress that is entered by your staff in the Staff Portal can be seen inside your Jackrabbit database in both the Class and Studentrecords on the Skills/Levels tab. For more information on working with Skills/Levels in your database see Students: Skills/Levels.